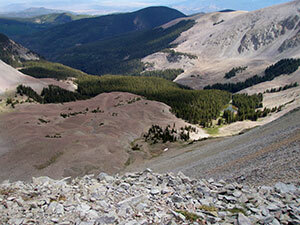 The United States Congress designated the Latir Peak Wilderness (map) in 1980 and it now has a total of 20,420 acres. All of this wilderness is located in New Mexico and is managed by the Forest Service. This remote area has deep forest cover interrupted only by pleasant meadows and alpine tundra on the northern portion's Latir Mesa. With three peaks exceeding 12,500 feet in elevation, including a portion of the Sangre de Cristo Mountains, this Wilderness showcases the very finest of New Mexico's high country. An abundance of southern Rocky Mountain wildlife takes advantage of the region's riches, including mule deer, black bears, badgers, beavers, bobcats, coyotes, ferrets, foxes, mountain lions, marmots, martens, and muskrats. Heart Lake, named for its romantic shape, is the source of Cabresto Creek. The Lake Fork Trail is the most popular of the main trails. It begins at Cabresto Lake and continues five miles to Heart Lake, which is 11,520 feet above sea level. More ambitious hikers can head five miles past Heart Lake to enter the magnificent country of Latir Peak and the alpine mesas. Two other trails, Midnight and Bull Creek, run west and receive much less use. Planning to Visit the Latir Peak Wilderness? How to follow the seven standard Leave No Trace principles differs in different parts of the country (desert vs. Rocky Mountains). Click on any of the principles listed below to learn more about how they apply in the Latir Peak Wilderness.